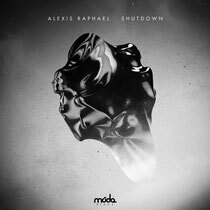 Moda Black is back with a new EP from Alexis Raphael. On 'Shutdown' Raphael serves up two tracks that continue in the tradition he has already established in the early part of his career. He is part of London's new breed of electronic music acts and earned his stripes across the pirate radio stations of North and East London during the late '90s and early '00s, going on to hold residencies at clubs such as The Cross and Bagley's. Alexis then knuckled down in the studio and got his first release, ‘Spaceship’, signed in 2011 to Jamie Jones and Lee Foss' Hot Waves imprint bringing him into the international spotlight. ‘Shutdown’ is a full-blooded main room house tune with sharp hi hats, inviting bass that drops in and out and plenty of other stylistic flourish from Classic Loon bird calls to reverse synth stabs and ravey vocals. On the flipside, 'Exclusive' is a little more heads down. It's a deeper cut with rolling drums, chilly; ticking percussion and curious bassline that works its way in and out of the arrangement. Drum fills, echoing but indecipherable vocals and a hypnotic relentlessness all make this a decent tune. It’s out now.